We all have things we wish for, but for the past two weeks, my normally long wish list has shortened down to one simple thing: I wish my shoulder didn’t hurt. I’ve spent so much time at work, on the computer, that I seem to have pinched a nerve, or possibly several, given the radiating pain from the area. The pain doesn’t respond to Tylenol or Advil. What it does respond to is not sitting in front of a computer holding a mouse. It’s not as bad as last time this happened, a couple of years ago, when the pain was in my neck, and I couldn’t turn my head, which made driving to the doctor – or anywhere – a bit of a challenge. This time, I can drive, but don’t see a point in going back to the doctor, since I can still remember the advice he gave me: Take some Tylenol and don’t spend so much time in front of the computer. I tried that for a few miserable days, then had The Departed drive me to a local spa, where the massage therapist pounded the pain out of me. If only all pains in the neck could be dispensed with so expeditiously. I’ve been trying to find time to get over to the spa, but the same work schedule that created this situation also prevents its resolution – I can’t get away from my desk long enough. I stop sending emails outside of work hours, and find myself communicating in ways I’d mostly abandoned: I get on the phone. I write an actual letter on actual stationery (I still own some) and put an actual stamp on it. The eventual recipient of that letter, my aunt, never really warmed to the internet age: When she first got an email account, she sent me a message with it, which I received via email, and then again several days later, by regular mail. She had printed out her email and mailed it to me, even though I had already replied to her electronically. She continued this practice until she finally retired from her job, and with it, her access to email. After the past couple of weeks, I can say I rather understand her relationship with technology, and I was pleased to realize that I didn’t experience any pain when doing pretty much any task that didn’t involve a computer. I can still walk the dog, and cook a meal, and operate a vacuum, without any shoulder pain, although I’ve eased up on the vacuuming, because, obviously, I don’t want to aggravate my shoulder. I cook a couple of big meals, so that I can open up the refrigerator and make a nice meal of leftovers even if things take a turn for the worse. I make a big pot of Spicy Three-Bean and Corn Chili, a cauliflower recipe that was pretty much just that, and then some Stuffed Cabbage. If it has cabbage in the name, it must be good for you. 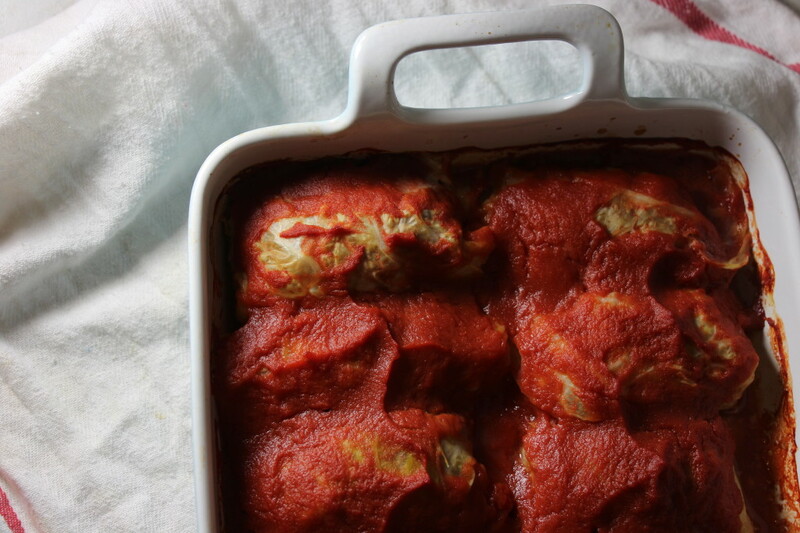 You can argue the point if you like, but I suggest you don’t, because this stuffed cabbage has all the virtues a recipe should: It’s simple to make, has easy-to-find ingredients, and is crazy delicious. The sweetness from the currants and brown sugar is perfectly balanced against the acid of the red wine vinegar (I used a Cabernet Sauvignon vinegar that I acquired during a rare salad-eating phase a while back). The seasoning is simple (thyme, salt, and pepper). I made the filling a couple hours ahead of time, then stored it in the refrigerator until I was ready to bake. The whole rolling and filling of cabbage leaves does take a bit of time, and you’ll want to have plenty of clean kitchen towels or papers towels on hand because those leaves hold a lot of water in all the little wrinkles. I followed the directions for using 1/3 cup of meat in each roll, and found I had one roll too many to fit in my pan. I baked it alongside, in a separate dish, and gave it to the Red Dog, who was exceedingly appreciative. The Child saw the finished dish and announced, You make some really weird-looking food. She was hungry enough to try it, and though she liked the filling, she would not be induced to even taste the wrapper. I ate the leftovers for lunch every day until they were gone. I found this recipe on the Kitchen Repertoire blog, which has much nicer pictures of it. Melt butter in small saucepan over medium heat. Add onions and cook until just soft and translucent, a minute or two. Combine beef, rice and eggs in a mixing bowl. Add onions and season with a heaping 1 teaspoon sea salt, pepper and thyme. Add currants. Mix well; cover and refrigerate until needed. Whisk together tomato sauce, brown sugar and vinegar. Season with a pinch more salt and set aside. Carefully peel back outer leaves of cabbage, using a sharp knife to cut leaves from stem. Cut out thick part of spine, creating a narrow long V in each leaf. You will need about 12 leaves. Fill a large pot with water and bring to a boil. Fill a large bowl with ice water and set next to stove. Salt boiling water. Working one leaf at a time, blanch until tender, about 30 seconds, remove from boiling water and submerge in ice water. Add more ice to water as needed. When all leaves are blanched and chilled, drain and pat dry with paper towel. Heat oven to 350. Shape meat into a 12 rectangular shaped patties, using about ⅓ cup of filling apiece. Place patties on leaves and roll up to create a neat package, then place in baking dish with the flap side down. Make sure no meat is exposed; if it is, use an extra cabbage leaf to patch. Pour tomato sauce over cabbage rolls. Cover baking dish with tin foil, and bake about 50 minutes, until the meat is cooked through and sauce is bubbling.